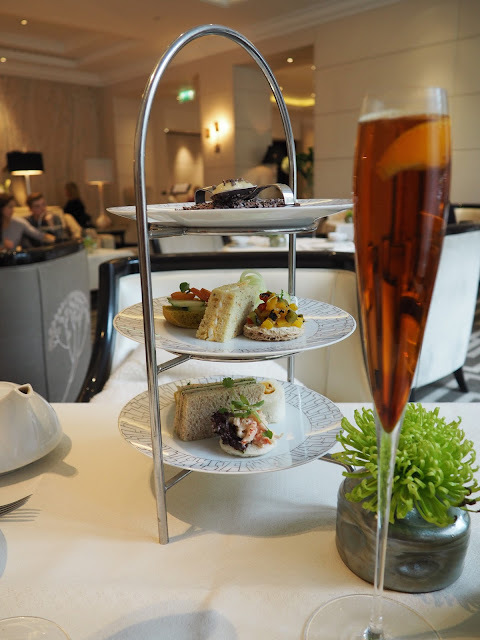 Last Saturday, Katie and I decided to go for afternoon tea at the Intercontinental Hotel, Park Lane. Since it was National Chocolate Week, we opted for their special edition Chocolate tea. I hadn’t visited Intercontinental before, but was greeted by a very polite doorman upon arrival as I entered the stunning lobby. We were kindly given a table right next to the window (a necessity as a blogger!) and were seated by a friendly waiter. The tea began with a rather autumnal-looking Champagne cocktail, which I believe contained orange, and cocoa, followed by our chosen teas – I opted for a jasmine green tea. After a few tips of our cocktails, our first course of the afternoon tea soon arrived on a tiered stand, on the top plate was a large circular piece of dark chocolate with two ‘pear pearl drops’ positioned on top. The drops exploded in your mouth with some sort of pear juice inside – a surprise but delicious! In fact, we managed to capture each other’s reactions! We decided to leave the dark chocolate until the end, and moved onto the other plates which displayed our finger sandwiches. One plate of ‘normal’ sandwiches for Katie, and a plate of vegetarian sandwiches for me. Sandwiches eaten, tea sipped and cocktails under way, we were then given a pot of chocolate tea each before the next course. As I’m not hugely fond of hot chocolate, I wasn’t overly keen on the idea of chocolate tea, but was pleasantly surprised. It smelt very chocolatey, but the taste was much more delicate – a herbal tea with a gentle blend of chocolate. Something I would happily enjoy again. The scones were soon on their way, and again we enjoyed two miniature scones each. One was a traditional scone served with a lot of cream and a pot of jam, and the other was a marshmallow and chocolate chip scone, served with a thick chocolate spread. The chocolate course shortly arrived with three chocolate desserts each. The first was a chocolate dome with a pistachio base and a lemon mousse filling, which was absolutely delicious. We were advised to cut this dome in half to see the layers. Despite not being a pistachio fan, and Katie isn’t usually keen on citrus flavours, the chocolate dome was incredible. Unfortunately we felt far too full to manage the remaining two chocolates or the original chocolate plaque from thin first course, so we were kindly given a box each to take our chocolate home. My plan had been to enjoy them later on that evening, but sadly I returned home to a boyfriend who ‘helped’ – in fact, I didn’t get a look in! The other two chocolates were a milk chocolate mousse with coconut and chilli, and a blackberry bavarois dark chocolate frangipane tart, which looked beautiful. Overall, we had such a lovely afternoon enjoying the chocolate tea at Intercontinental, Park Lane and of course having a much needed catch up with Katie! If you haven’t already, go and take a peek and Katie’s blog, Kalanchoe. Have you been to the Intercontinental, Park Lane before? I would return in a heartbeat! Previous Post Bet 365 Festival Featuring The Hennessy Gold Cup and GIVEAWAY!